Directions: Using the digits 0 to 9, at most one time each, fill in the boxes to find the lengths of the missing sides such that the missing leg’s length is as long as possible. 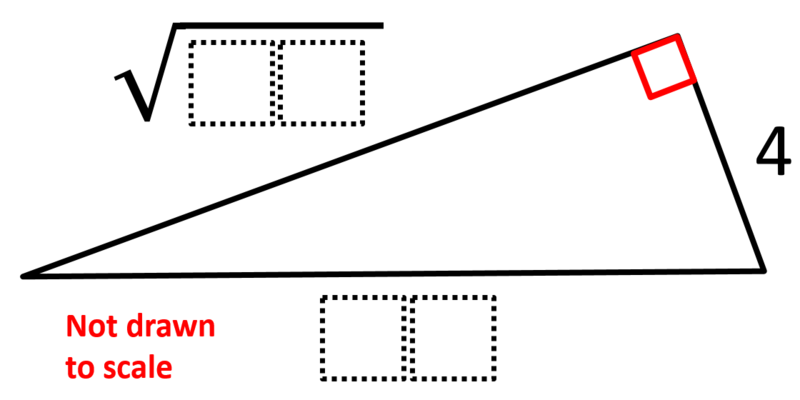 How do we figure out which side length would be easiest to assume? How do we figure out the length of the remaining side? Which side of a right triangle is the longest? The longest possible length for the hypotenuse is 10. If it was 11, you would not be able to make the leg long enough and only two digits. It also can’t be 4 or less as the hypotenuse has to be the longest side. Therefore, 4, √84, 10 is the optimal solution. Be on the lookout though for students who make the leg longer than the hypotenuse. While we want the missing leg to be as long as possible, it still has to be less than the length of the hypotenuse. So, this is a good chance to check for misunderstandings. 4 and 84 share a digit of 4. Shouldn’t that response be eliminated, too? The reason that is not eliminated is because 4 is given. There is just no repeating of the numbers you use, not including ones that are given. Ok, got it! Thanks for the swift reply. Couldn’t 4, sqrt(65), and 09 also be a possible solution, albeit not as long as your given optimal solution? You are totally right Karl. I’ve updated the answer accordingly.